Apple pie doesn't get much more iconic, and hard to imagine it could get any better. But it can, with this French Apple-Custard Pie. Sautéed apples, creamy vanilla custard, and crunchy almond streusel come together to create the ultimate autumnal pie - perfect when you want to celebrate a holiday with a familiar, yet elegant dessert. Pink Lady apples are the best choice for this pie. They're crisp, sweet, tart, and available year-round. For the filling, melt butter in sauté pan over medium heat. Add apples and 2 Tbsp. sugar; sauté until apples are soft but not mushy, 8–10 minutes. Stir in rum and salt. Spread apples over the bottom of the blind-baked crust. Whisk together eggs, egg yolks, cream, 1/2 cup sugar, vanilla, nutmeg, and remaining 1/8 tsp. salt; pour over apples in pie crust. Bake pie until custard is barely set in center, about 30 minutes. For the almond topping, combine almonds, sugar, and softened butter, and a pinch of salt in a bowl. Remove pie from oven; sprinkle with topping. Cover pie with a pie shield if the edge of the crust is overbrowning. Return pie to oven; bake until custard is almost set but still slightly jiggly in the center, 15–20 minutes more. Cool pie completely before slicing, or chill pie, then bring to room temperature when ready to serve. To core an apple, stand it on its blossom end and slice off the four lobes around the core. Just a touch of rum adds a delicious flavor to the sautéed apples. Apple cider can be substituted. Thoroughly whisk together the egg mixture before pouring it over the apples in the crust. 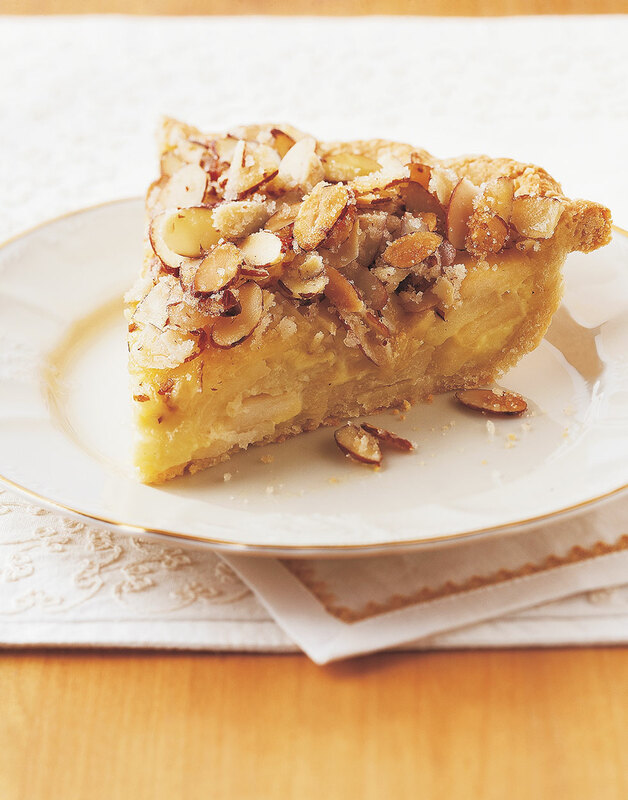 Once the custard begins to set, top the pie with the sugared-almond mixture. Continue baking.